You want your child to look forward to learning phonics. This set of charts and games with corresponding punch-out pieces ensures fun every time! 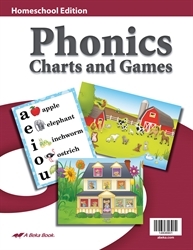 The set includes vowel and consonant charts, cursive and manuscript formation guides, and right hand/left hand charts as well as four games: Old MacDonald’s Farm, Mouse House, Going Up, and Over in the Meadow. A teaching tips booklet gives practical pointers for making the Phonics Charts and Games an exciting teaching tool. K4–K5.